Wallace C.H. Choy, a professor, at the Dept. of EEE has recently elected to Fellow of The Optical Society (OSA) for his significant contributions in designing and understanding optical nanostructures for plasmonic, photovoltaic and light emitting devices. Founded in 1916, The Optical Society (OSA) is the leading professional association in optics and photonics, home to accomplished science, engineering, and business leaders from all over the world. Through world-renowned publications, meetings, and membership programs, OSA provides quality information and inspiring interactions that power achievements in the science of light. Over the course of OSA’s nearly one hundred year history, 34 OSA members have been awarded a Nobel Prize in Physics, Chemistry or Physiology/Medicine. 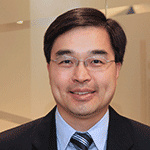 Prof. Choy has made extensive contributions in designing and understanding nanostructural optoelectronic devices. In HKU, he conducts the pioneering work on plasmonic multi-physical (optical-electrical) studies and multi-trapping schemes of integrated metal nanostructures for photovoltaics. His previous works of semiconductor nanostructural devices such as real-time wavelength-tunable distributed feedback (DFB) lasers and grating-based multiplexer (MUX)/ demultiplexer (DEMUX) have been developed and adopted in industries. After the MUX/DEMUX-breakthrough announcement, the stock price of Mitel Inc. increased by 46% and a spin-off launched the new technology. His works have drawn wide attraction of Nobel Laureate and pioneers from different fields, and has been further studied and adopted. Prof. Choy was recognized as Top 1% of most-cited scientists in Thomson Reuter’s Essential Science Indicators in 2014 and 2015, and named as prolific researcher on organic solar cells in Nature Index 2014 Hong Kong published by Nature. For his technical contributions, Prof. Choy has been invited to serve in various editorial boards including Editorial Board Member for Nature Publishing Group of Scientific Reports and IOP J Physics D, Senior Editor of IEEE Photonics Journal, and Topical editor of OSA JOSA B.